EL REY DE JETLAG - mudd up! Today, this Friday, Dutty Artz goes to Boston: Jahdan Blakkamoore, Matt Shadetek, and I will be perform at the Institute of Contemporary Art’ s waterfront outside space, along with Nomo. On Saturday, 2 events in D.F. Mexico City, both free! 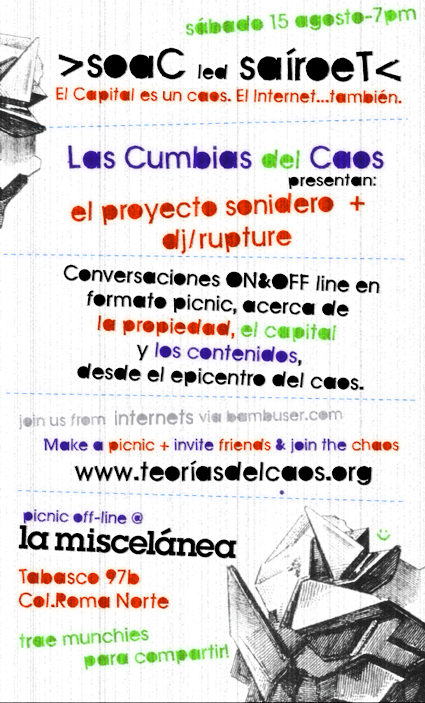 First, the ‘Cumbias de Caos’ picnic-talk (picnic as a model of sharing) with Mariana from Proyecto Sonidero and myself. Vamos a platicar un poco acerca del caos sonidero a lo largo y ancho de la calle, el internet y sus alrededores. This happens at 7pm in Miscelanea. Hugs to Las Teorias del Caos! The picnic talk will be video-streaming somewhere in interlandia. If you haven’t gone to Mexico City, you should… It’s the kind of place where (this happened to me) suddenly you find 12 people in the flat where you’re staying (you’ve invited them up, apparently) at 2 A.M. and one of them is putting together an Afrosound compilation and then you all decide to go eat and the place you arrive at used to be a Chinese restaurant, but that flopped so it turned into yet another Mexican restaurant serving Mexican food in Mexico (this is good thing), but they kept the intensely ‘Oriental’ decoration anyhow (reverse ethnic-ization? ), and when you finally return to the apartment you find a freshly cut potato lying on the table. Not a whole potato, just a sliver cross-section. The apartment had had no food or knives in it. One of the girls must have done it but you have no idea which one, or why. Had she been carrying the potato all night? I ask B. to tell us a ghost story and she says “i have one but it’s true” and while she’s telling it A. falls asleep but I’m left up, awake (not for long, let’s face it), because the story was truly awful. I had asked for it. As if to explain the potato slice & many other things, all of them in fact: “se ve cualquier cosa en Mexico” said my friend Symphony the next day, temporarily partially blind, before he stumbled out of the Tepito ceviche stand in search of a bus to take him home. Gender melt. Also, Mexico City is a nice place to get books in Spanish. Tuesday finds me (celebrating my birthday) in Santiago de Chile, where Andy Moor & I will DJ the opening night of the Santiago International Film Festival. (Andy’s a great DJ!). On Thursday at the same festival, I’ll be joining Fugazi’s Guy Picciotto, Andy, & T. Griffin, as we perform live music to a new Jem Cohen film, Mexico City By Chance. Jem has re-edited the material from our D.F. debut a few months back; this recent incarnation is looking lovely. There will be a workshop or talk as well, with Jem and some of the other musicians, but I will be flying back to D.F… to fly back to NYC… to fly to France… but more on that next week. So. If I fall asleep while talking to you, you know not to be offended.